It has been a slow summer. So it has been until now that I have gotten out into some surf with my buddy's GoPro camera. It mounts on the front of the surfboard and has a super wide angle lens to capture a much larger area even at close range. Having the camera on the board also give you some idea of how big the wave is, although it can be misleading if I am the top of a wave vs at the bottom. The south swell was wrapping into the bay perfectly this morning. The wind was non-existent. And there were only a few other surfers out. A perfect combination. The tide was low so I had to watch out for shallow coral when the waves would close out on me. I think I stayed in the waves a little longer than I normally would if I didn't have the camera attached. But if you don't have a pro photographer following you to each session the Go Pro can be a great addition. It also lets me critique my surfing style from an angle I have never seen before. 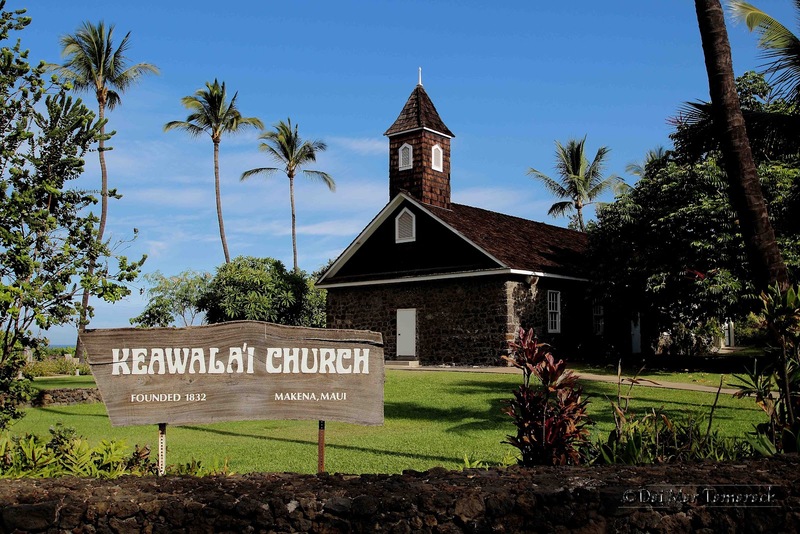 It is pretty amazing how the different sides of Maui can be so different on the same day. Dry vs wet, sunny vs cloudy, windy vs calm. Sometimes looking at the water can also show a dramatic difference. The photos on top show a massive swell coming in on Maui's North shore around sunset, while the photos on the bottom show sunrise on the South shore on the same day. Take a close look for people in the pics on the right to size up the waves. Today I was on a solo adventure and had a mission. 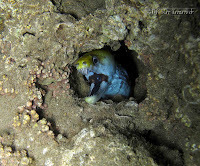 I was going to find a dragon moray eel and the swim thru/cave at this site that I had only heard about. I found eels but none of them dragons, and even though I used most of my air getting there I found the swim thru. This is a picture of it at the top right. 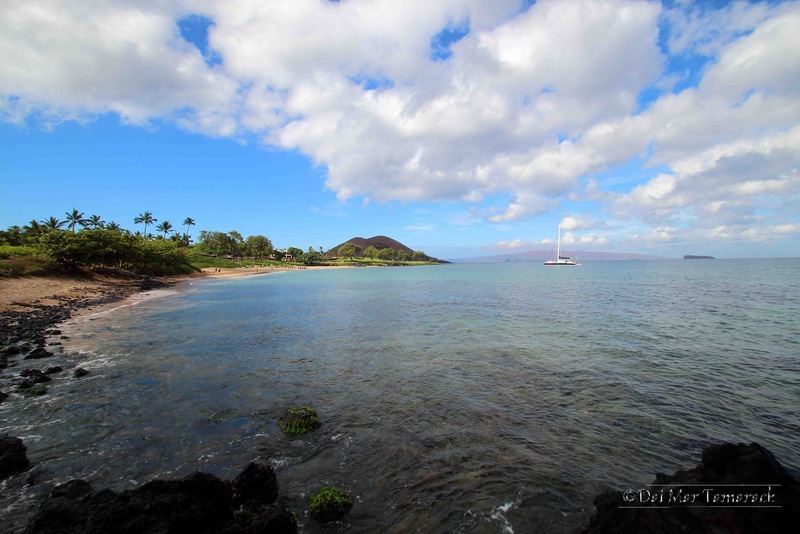 It was a glassy morning in Makena, Maui, perfect for a dive. I entered at the black sand beach in Makena State Park just to the side of this massive cinder cone known as Pu'uOlai. 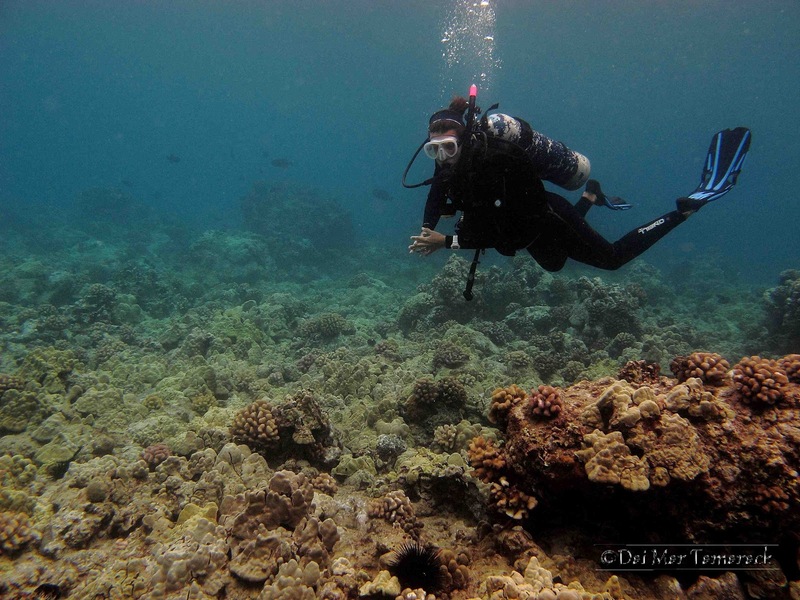 The reef here is dominated by finger coral until you hit the point. After that you have big boulders, walls, and patches of sand. 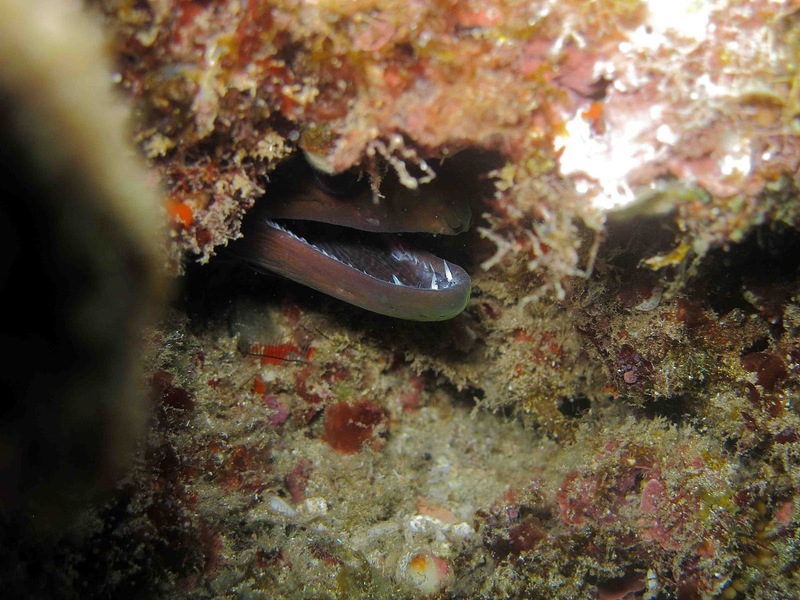 This undulated eel looked very dangerous but acted like he needed a better hiding spot. 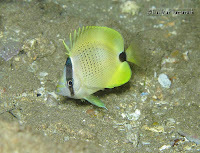 I was very excited to find a reticulated butterfly fish. I haven't seen one of these for many months. 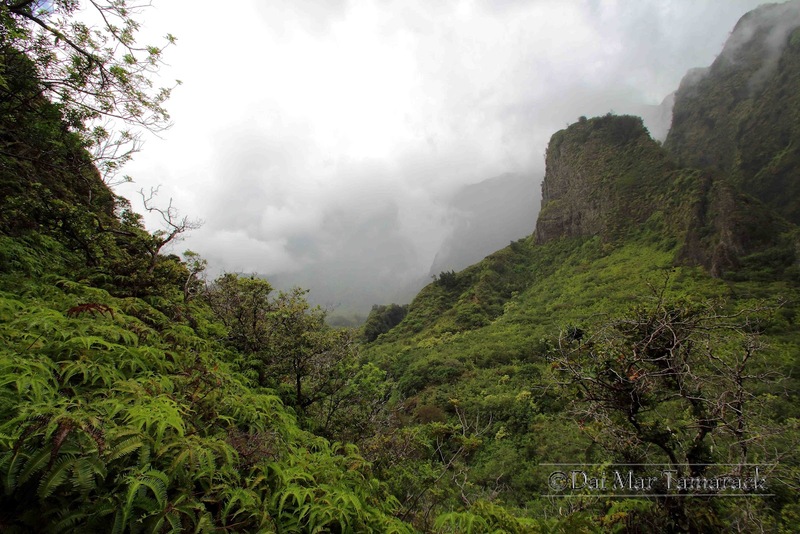 They are quite rare here in Maui as we are on the very edge of their habitat. Only a couple nudibranchs showed themselves although the area looked very promising. I covered a lot of ground underwater and swam past many sea turtles. This one just happened to catch the light just right to be bathed in sun rays in the early morning light. I wonder what you should call a muck dive if the visibility and conditions are really bad. It almost seems inherent in the name 'muck dive' although we sometimes get great visibility on our muck dives. However this was not one of those times. A south swell plus strong winds provided us with very limited visibility and a lot of kicked up sand in the water column. 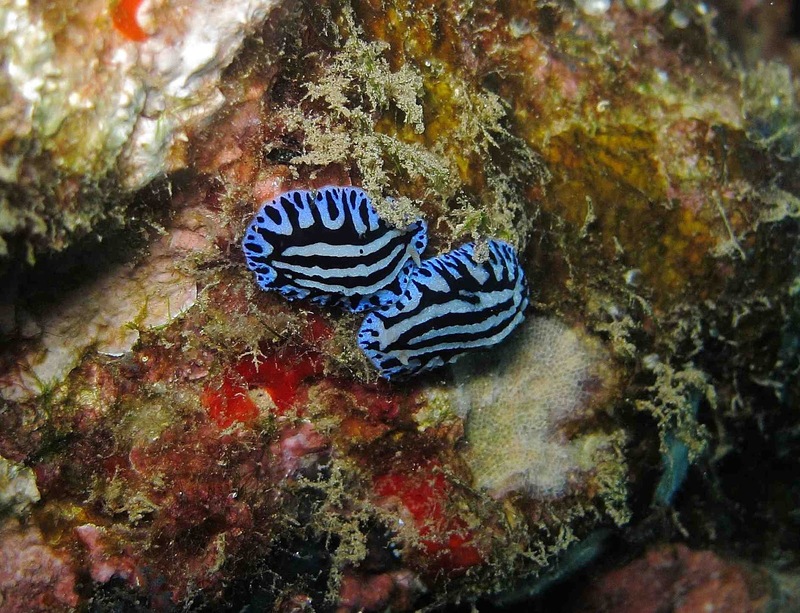 But despite this Heidi and I found some incredible nudibranchs. An umbrella slug, about the size of my hand was almost completely camouflaged despite its bright orange exterior by covering itself with sand. 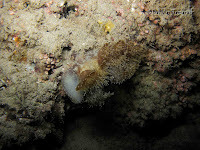 Two bright orange rhinophores sticking out gave it away. 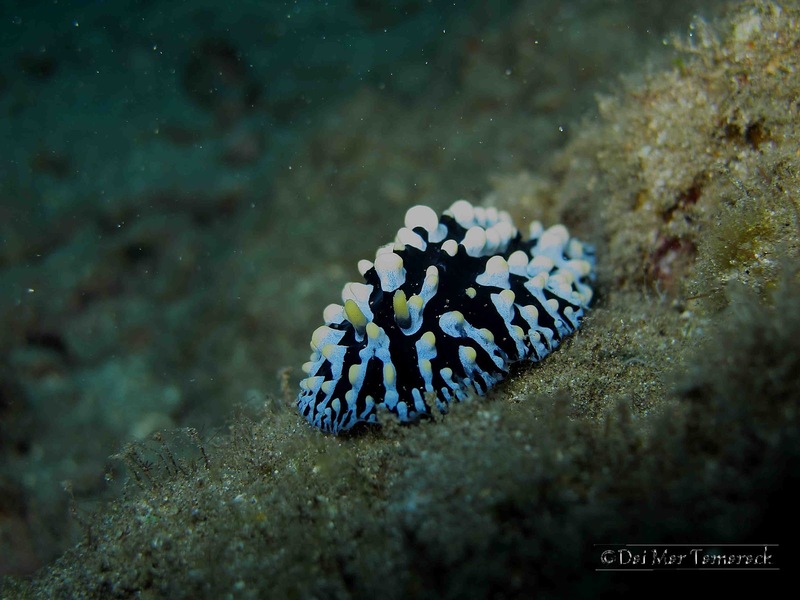 A snow goddess nudibranch was found hanging out under a small ledge trying to find protection from the surge. 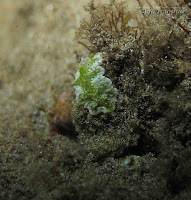 The next nudibranch we spotted was my first ever Jolly Green Giant nudibranch out during the day. I had seen only seen two others up till now and both were at night. 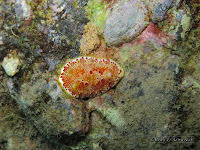 This guy had a damaged rhinophore and was about the size of Heidi's pinky nail, but stunning color. 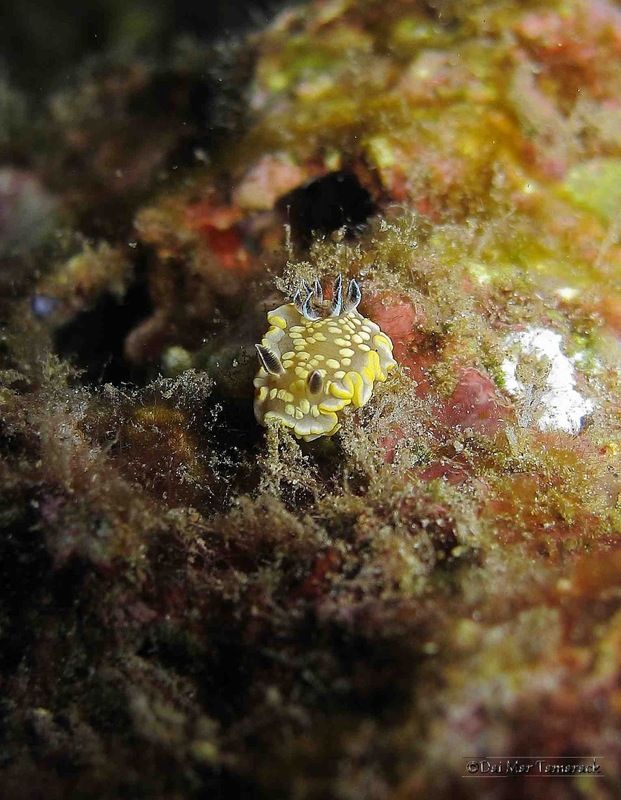 No dive is complete here without seeing a gloomy nudibranch and we almost went the whole dive without one but I found this little guy braving the surge on the outside of some coral covered rocks. It was the smallest one I have seen yet. how it went today. I was watching the waves trying to keep the ride relatively smooth when all of a sudden we were surrounded by about 300 spinner dolphins. It looked like they were having so much fun in the waves. Surfing down swell and then circling back around to do it all over again. It was hard to know where to look or where to take a picture. I watched them for about 20 minutes before even picking up my camera, just soaking in the experience. 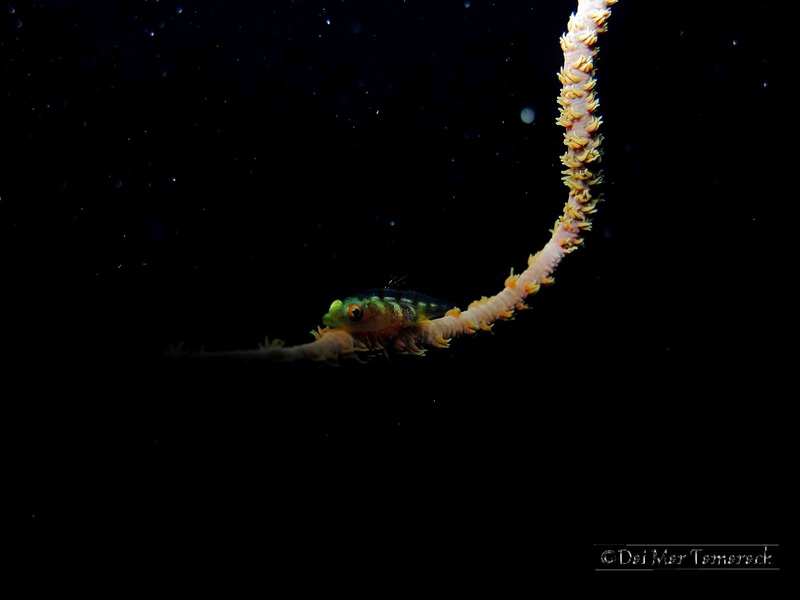 On this dive we came across big and small favorites and a few surprises as well. 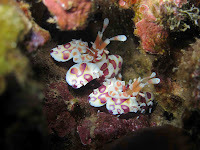 My favorite pair of Harlequin Shrimp haven't moved far. Sometimes they stay in the same place for months as these two have. On the other hand a white tip reef shark was something new to this site. 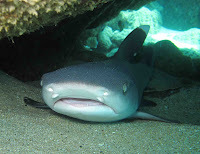 At a couple of places in Molokini I have seen white tips stay put for months as well. 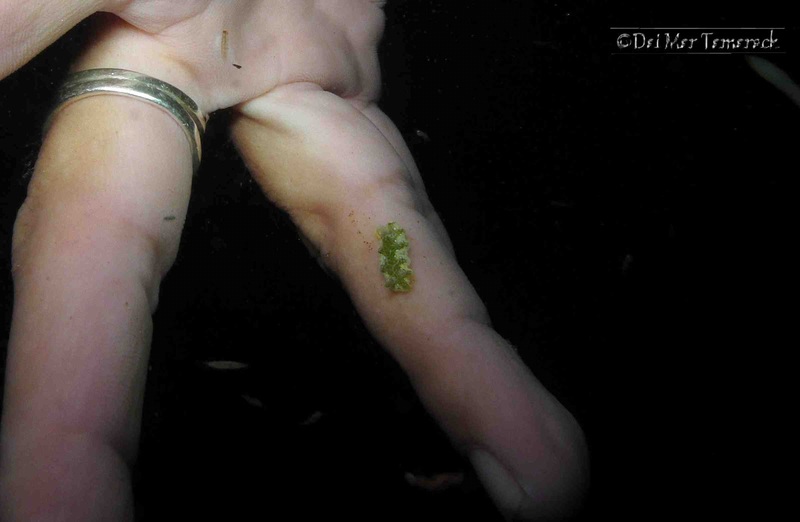 Checking the crevices for nudibranchs always offers some secret treasures for an underwater biologist. 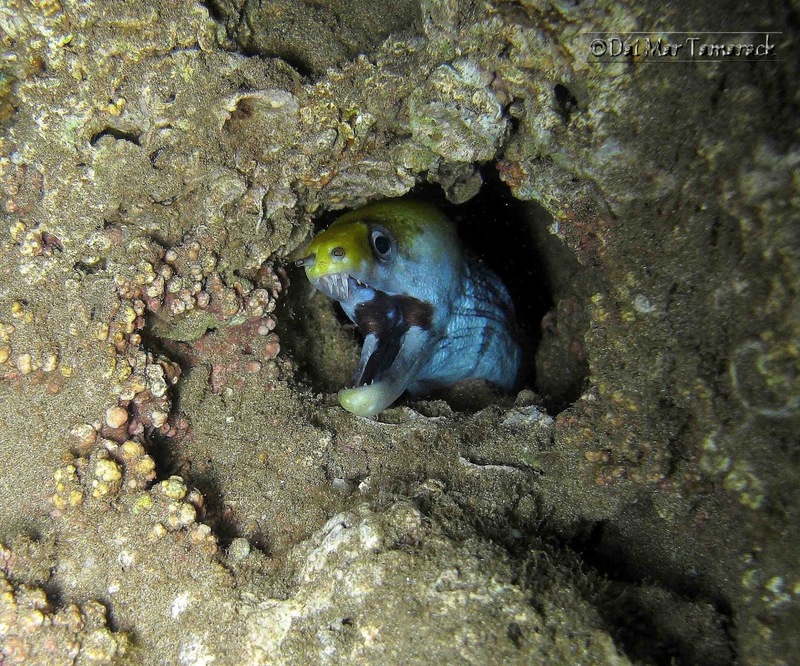 And it is a great way to get surprised by many kinds of moray eels. They are almost always docile knowing that they are well protected if only their head and mouth are exposed. However sometimes seeing their reflection in my camera can bring out the curiosity in them and they will come in for a closer look. I have had them bump right into my camera before. 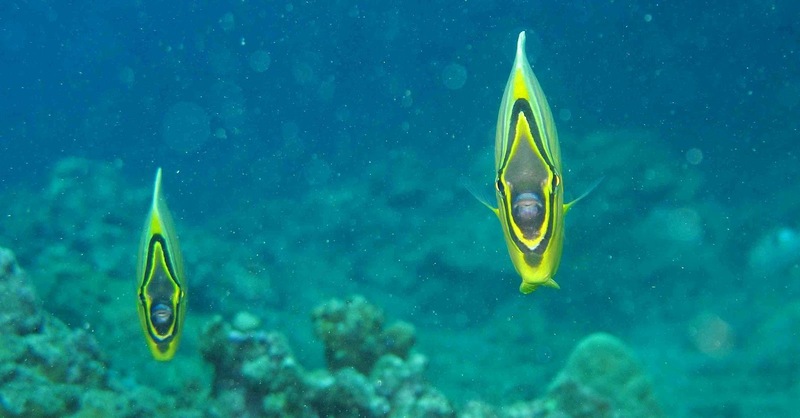 Some creatures on the reef are brightly colored like these oval butterfly fish. You are not going to miss them. 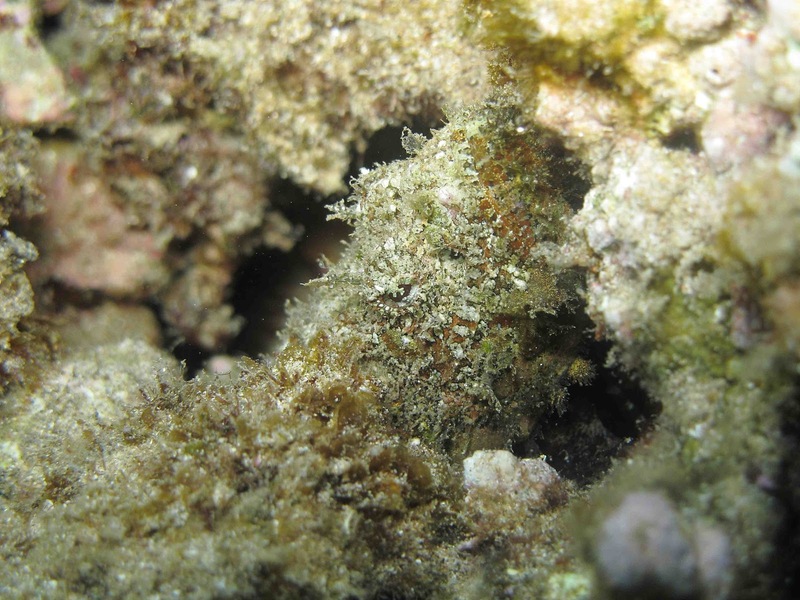 But finding things a bit more camouflaged like this scorpionfish can take a bit more skill and luck. 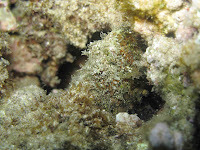 Can you see the scorpionfish in the picture? 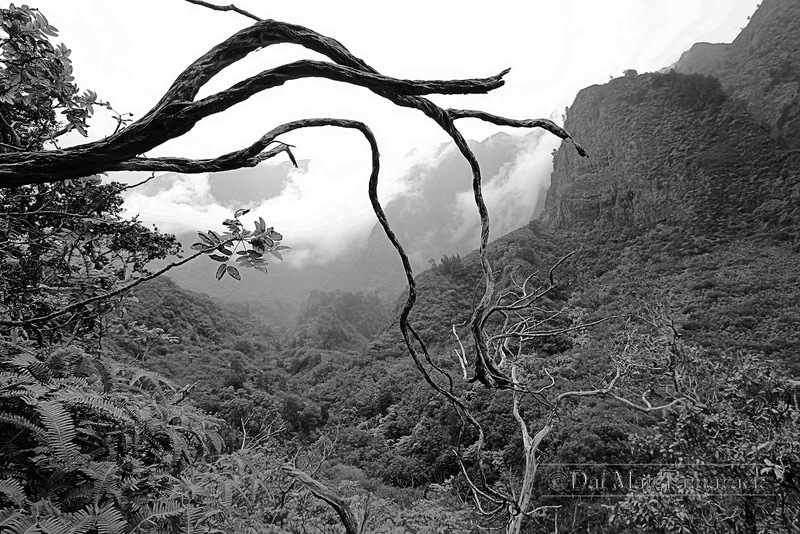 I don't get out to shoot topside here in Maui often enough. So getting a new wide angle lens is the perfect motivation. These are all just handheld with the new 10mm wide angle. I won't be able to travel without it now. Just like how taking a camera underwater makes you see things from a different perspective now I have that eye above water as well. Always looking for the next photo opportunity. Turtle Town isn't just for turtles anymore. Today Heidi and I went to a well known turtle hotspot for a scuba dive. 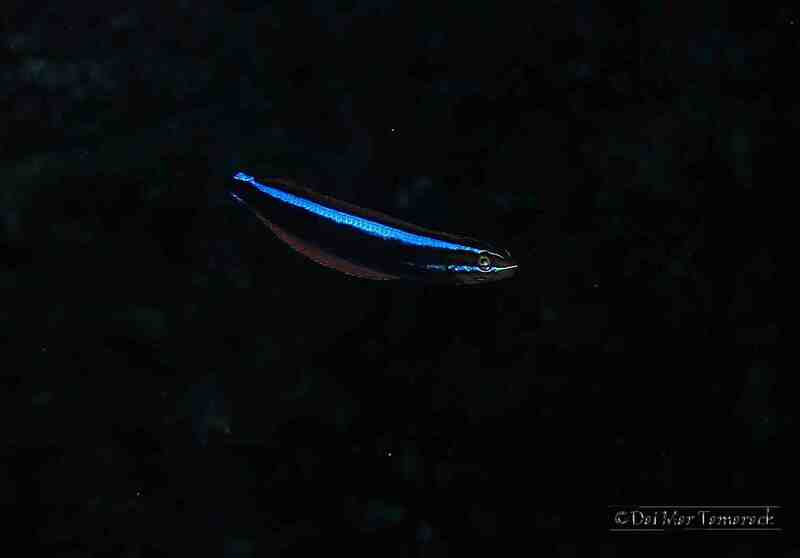 Knowing us we weren't there for turtle watching, we were looking for the small things like this iridescent blue striped Ewa Fang Blenny mimmicking the coloration of a juvenile cleaner wrasse in order to get in close to bite bigger fish. 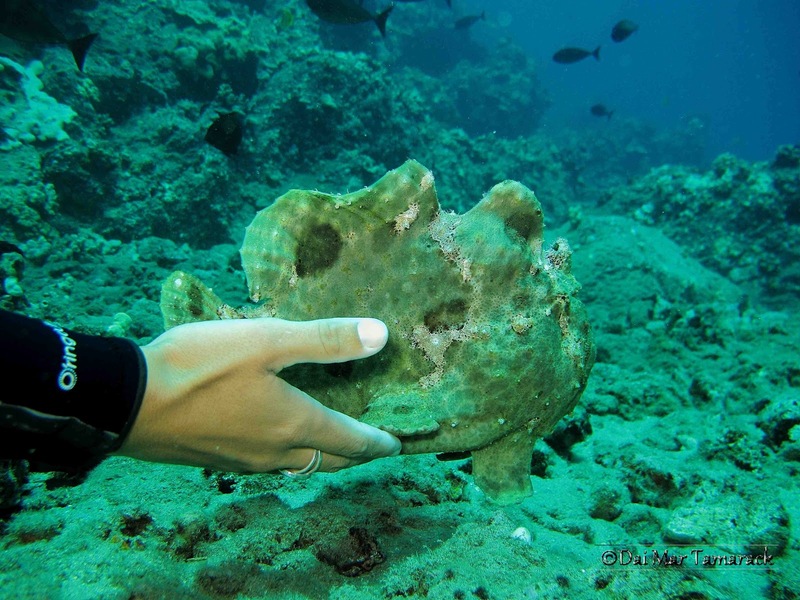 This frog fish on the other hand would not fit into the 'small' category. It was massive and very green. It was stationed just off the reef not moving, just waving its lure out to draw in unsuspecting prey. 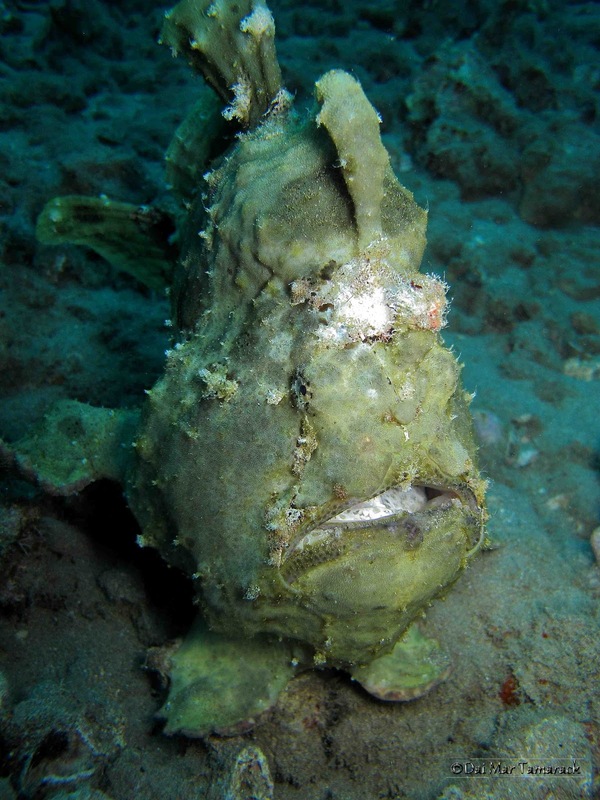 These frogfish are related to deep sea angler fish and have a very similar lure on their foreheads. photo the red color really popped. 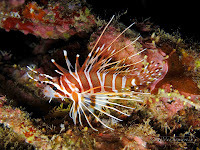 Also showing off a beautiful red were 3 different Hawaiian red lionfish that we saw. 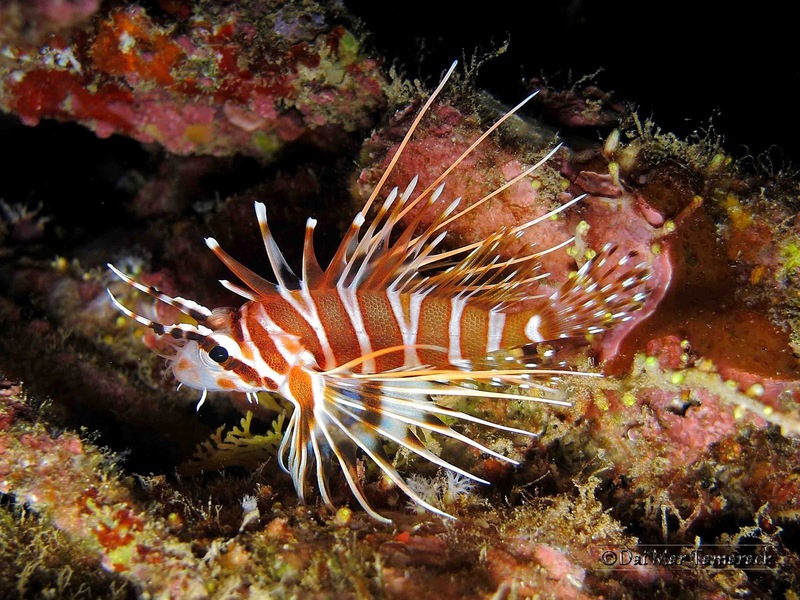 While they are hunted as invasive pest in many parts of the world these beautiful and venomous fish are native species out here in Hawaii. Many more nudibranchs can be found here at Turtle Town for those looking close enough. Tom Smith nudibranchs, varicose phyllidia, rosy phyllidia, trembling, white margin, and locust are just a few that we saw today. This site is also well known for some very cool caves that you can swim back into and explore if you have a light. The turtles like to hang out and rest in the caves if they aren't already being used by some friendly sharks. Wow. Check out the reef at night and have a totally different experience. Tonight we saw a squid that can fit in your pocket, a poisonous octopus with 2ft long arms on the hunt, and the holy grail of nudibranchs all in one dive. 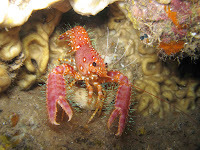 Checking out one of our favorite muck diving areas at night provided a treasure trove of picture opportunities. 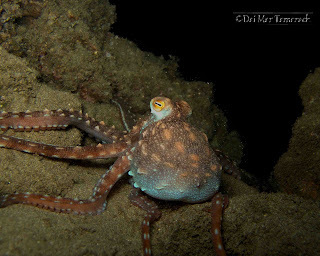 This ornate octopus to the left hunted for small fish and crustaceans by spreading out its arms into all the nooks and crannies of the rocks. After about ten minutes of following him he stopped, brought all his arms under him, quickly dug a hole by shooting water straight down in the sand, then totally disappeared under the sand. Incredible. 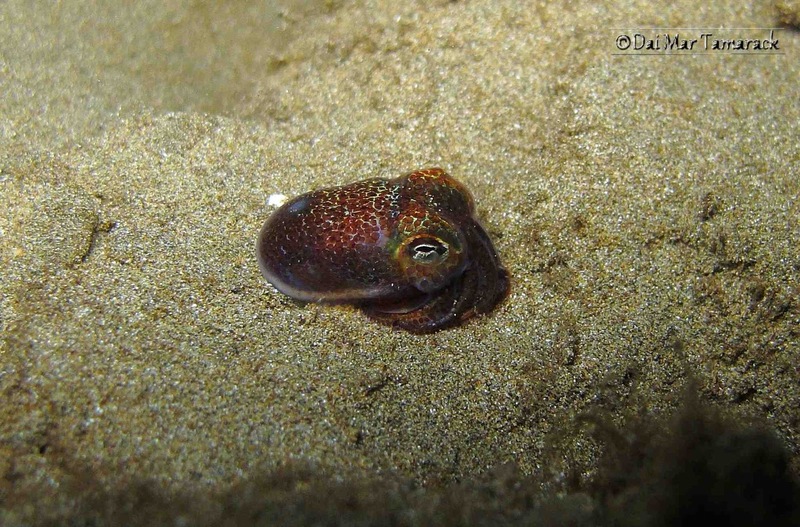 The next big find was actually a tiny one, this Hawaiian bobtail squid. 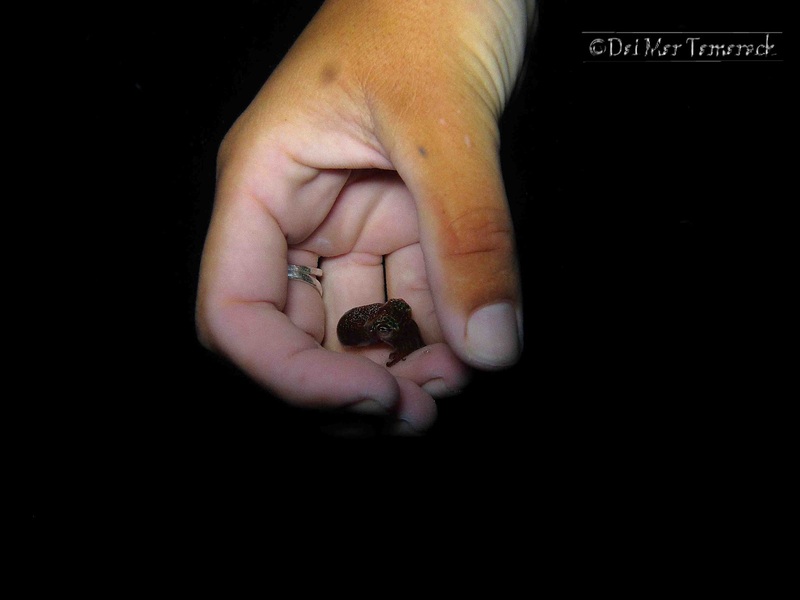 It is hard not to put this little guy in your pocket and take him home with you. Beautiful colors and glowing phosphorescent light provided by some very cool symbiotic bacteria that lives in the squid make for a wild nighttime show. He lives in the sand by day and emerges at night to search for shrimp to eat. 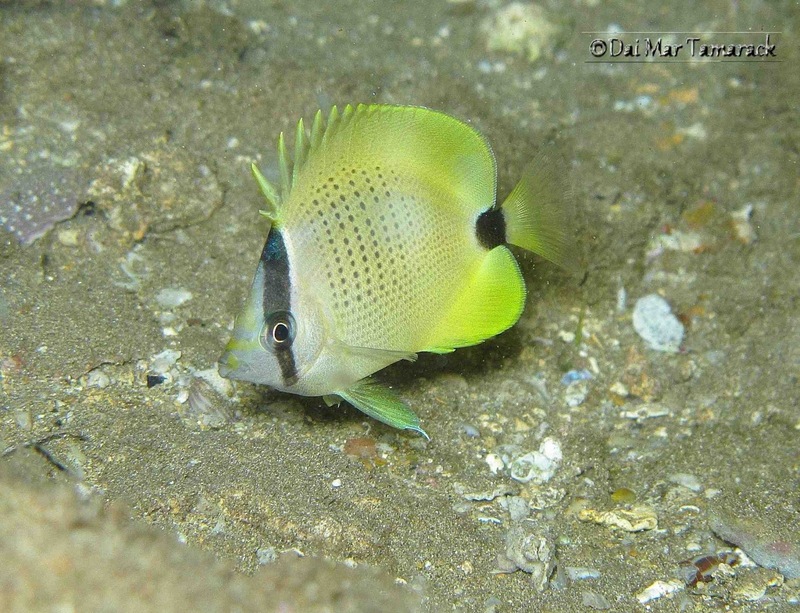 Small fish like this milletseed butterflyfish emerge during the day and hide in little holes in the reef at night. This little guy was not quite sure how to deal with my light shining at him so he froze...perfect for a picture. However when you steady yourself for the shot you must be aware of your surroundings. This like moray eels could be right nearby, hiding in a crack, looking to protect its nighttime lair. Heidi's big find- Jolly Green Giant! 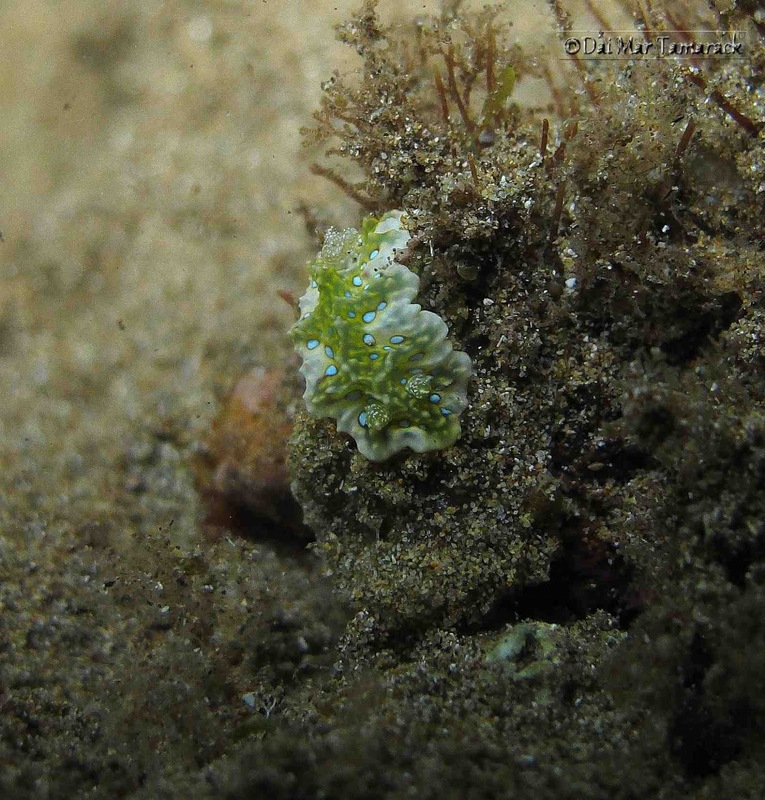 Another huge find on this dive was the holy grail of nudibranchs, a jolly green giant. Heidi somehow spotted this tiny little 'giant' and very excitedly called me over. You can see how small it really is in the picture of it crawling down Heidi's pinky finger. The green is very striking but I really like the light blue spots you can see when you zoom way in on it. Crystal-like frilly gills and rhinophores add to the fact that this is one of the rarest finds in Hawaii. Now Heidi and I have seen two! I have had the privilege of scuba diving all over the world. Sometimes when I see an animal it will remind me of another place far far away. This happened twice tonight. 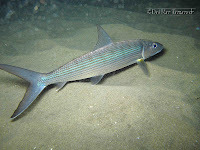 Once with a couple of bonefish skimming over the sand. My first job out of college was working at a fly-fishing resort in the Bahamas where people would flock to try and land these bonefish. Another was finding a large melibe nudibranch. Once at the outermost island of the Channel Islands, San Miguel, Snark and I happened upon a breeding bloom of melibes with thousands clinging to the kelp in the frigid 50 degree water.